The Remote Switch works just like a shutter button, enabling halfway or complete pressing. It also has a shutter-release lock. We appreciate the opportunity to resolve any problems. Nikon D800 D300S D700 D300 D200. Nikon D3 / D3X / D3S /D4. Nikon MC-30 Shutter Release Cord x1. Nikon D1 / D1h / D1x. Nikon D2 / D2H / D2Hs / D2X. Nikon F100. Nikon F90 / F90x. Nikon N90 / N90x. 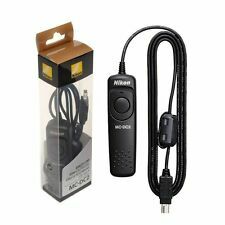 Nikon MC-36A Multi-Function Remote Shutter Release Cord. Compatible for Nikon. Remote shutter release. 10-pin remote plug. Key Features Get professional looking results at the push of a button. Connectivity : Wireless. Lithium CR2025 battery (inside) x1. Infrared cannot be seen by human eyes. We will answer or help you to solve the problems as soon as we can. We will be glad to reply and help you to solve any problem. Basically. Nikon 1 J1. Nikon 1 J2. Nikon 1 V1. is for use with the following Niko. Coolpix 8400. Auto triggering, delayed shutter release, single and continuous shooting are possible. From end of button, length of shorter cable 45cms approx, longer cable 54cms approx. Ideal for use with bellows systems. 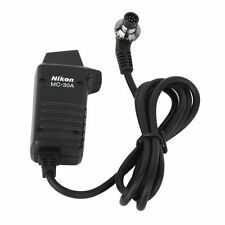 Nikon MC-30A Remote Trigger Release Cord D3 D3s D3x D4 D200 D300 D700 D800 D810. Condition is New. Dispatched with Royal Mail 2nd Class. $We also have RC-6 Remote Control for Canon, please check our other listing at: [https://www.ebay.co.uk/itm/232532290207] (https://www.ebay.co.uk/itm/232532290207) Or by item number of  (https://www.ebay.co.uk/itm/232532290207) Wireless remote control, controls the shutter release of specific Nikon D-SLR, Nikon 1 and Nikon COOLPIX cameras from a distance. It is ideal for shooting self-portraits and can help prevent camera shake during shutter release. 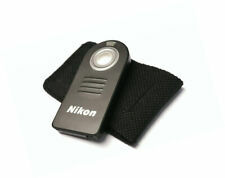 Infrared Remote Control enables wireless remote shutter release of select Nikon D-SLR, Nikon 1 and COOLPIX cameras. The ML-L3 offers an immediate release mode and two second delay mode. The range is approx. 16 ft in front of the camera. Useful for triggering the shutter remotely when using slower shutter speeds, to prevent camera movement. NIKON MC-36 REMOTE CORD. ORIGINAL NIKON MANUFACTURE. COMPATIBLE WITH THE FOLLOWING MODELS. D810A, D800E, D800, D4, D300, D300S, D3X, D700, D3, D3S & D200. Fits D4 D3 D800 D700 D300S D200 and many others. Nikon AR-1 Soft Shutter Release Button. Makes releasing shutter more comfortable and increases the level of the button. Assists gentle release. Nikon D7000, D3000, D90, D80, D70S, D70, D50, D60, D40, D5100, D40X. Cable shutter release - I’ve used it with Nikon cameras and it works fine. Has a lock to keep the shutter pressed for a length of time if needed. Please ask any questions! Note - To ensure correct exposure in modes other than M, cover the viewfinder eyepiece with your hand or with the supplied DK-5 eyepiece cap before pressing the shutter-release button. This will prevent light entering via the viewfinder from interfering with the autoexposure operation. 8400, 8800, Pronea S, F75, F65, F55, N65, N75, Nuvis S, Lite Touch. Nikon D7000, D3000, D90, D80, D70S, D70, D50, D60, D40, D5100, D40X. When knurled disc is turned anti-clockwise the plunger locks - depressing the disc releases it. Nikon AR-2 Cable Shutter Release. Top Nikon quality. Most useful for slow speeds and ideal for long exposures. Tested in my Nikon winder motor drive vertical shooting mode. 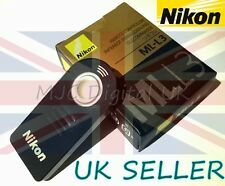 1 x genuine Nikon MR-3 shutter release. very useful switch and very hard to fine. Genuine Nikon MR-3 Shutter Release for MD-1, MD-2, MD-4, MD-11, MD-12. Very good condition. Full working order. 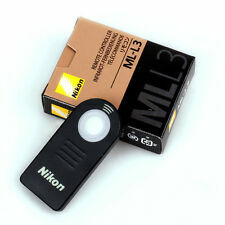 This Shutter release works for Nikon MD-1, 2, 4, 11, 12. Good Quality Photographic Accessories. Graded: Excellent Plus. (Signs of light use, but not misuse. ). Excellent Plus: Signs of light use, but not misuse. The grades are:'. Excellent: Signs of normal use consistent with age. Excellent Minus: Well used. For use with the Nikon F and F2 where the shutter release button does not have a threaded release button. Graded: Excellent Plus. (Signs of light use, but not misuse. ). We have a number of these in similar condition. Well, now you can say good bye to spoilt pictures with this shutter release cord. For steady shots as: Macro, night shots. Genuine Nikon MC-12A Shutter Release Cord. Release cord switch only. In perfect working order. Nikon Pistol Grip , Please Read The Description , thankyou . This Nikon Pistol Grip is missing the little plate that fits on the top. It shows clear signs of wear. You get exactly what you see. Nikon D7000. Nikon D5000. Nikon D40 Digital SLR. Nikon D40X Digital SLR. Nikon MC-12B Remote Release. Good condition with signs of use and few marks. Genuine Nikon AR7 Double Cable Release in original box and probablynever used. Filter Queen No.1. In great condition, ready for use. ORIGINAL BRAND NEW STOCK NIKON ML-L4 REMOTE CONTROL WIRELESS TO FIT NIKON COOLPIX DIGITAL CAMERAS NIKON COOLPIX S1000PJ ITEM IS NEW IF YOU HAVE ANY QUESTIONS PLEASE CONTACT ME. Compatible with Nikon KeyMission 360 / 170 action camcorders. Compatible with Nikon KeyMission 360 & 170 action camcorders. Nikon D90, D3100, D3200, D5000, D5100, D5200, D5300, D7000, D7100, D600, D610 and COOLPIX P7700, COOLPIX P7800, COOLPIX and more. The cord is 3.3' (1 m) long. We will always help you to have a 100% positive happy buying experience. Also available is the new Nikon AstroIR astronomical / long exposure photography remote. Model Nikon TL-Lite. Battery life over 300 hours continuous use with the TL-Lite set at one shutter trigger every 4 seconds. 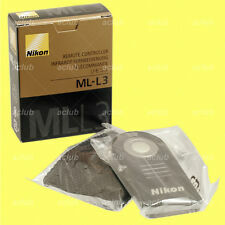 Nikon ML-L3 IR remote shutter release. It worked perfectly with my Nikon D7100. In projector mode To change the projected still pictures and to play back movies. Key Features. Key Specification. Debit Card. Nikon ML-L3 Wireless Remote Control (Infrared) for D7200 D750 D5500 V3 J1 P900..